QRP Labs launched the new "QCX" mono-band 5W CW transceiver on 21st August. Orders have continued to flow in at a high rate. This kit really seems to have captured the imagination of the QRP world! The QCX transceiver features an easy-to-build, single-board design with all through-hole components (for easy construction). The only two ICs are already factory pre-soldered. The kit is available for your choice of 80, 60, 40, 30, 20 or 17m. There is a built-in Iambic keyer, CW Decoder, PLL-synthesised rotary encoder tuned VFO with 2 x 16 backlit LCD, 200Hz-wide audio filter and cool-running Class-E PA. 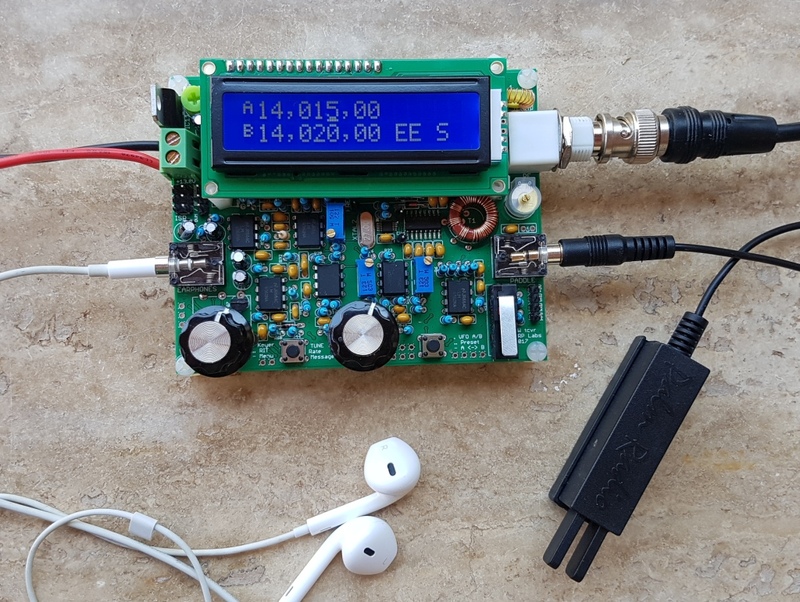 The firmware is packed full of functions such as dual VFO A/B, Split, RIT, preset frequency and message memories, and even a beacon mode supporting CW or WSPR operation. A GPS interface supporting an optional GPS such as the QRP Labs QLG1 kit, makes WSPR timekeeping and frequency discipline easy. Best of all, the kit includes built-in test equipment (Signal Generator, Frequency counter, DVM, RF Power meter) and self-alignment tools so it can be built (and if necessary, debugged) without any additional test equipment. Did I say "best of all"? I meant 2nd best of all. Of course BEST OF ALL is the price of only $49 which has been getting a lot of attention. The chart below shows orders to date from 43 different countries (by post office designation, not DXCC!). 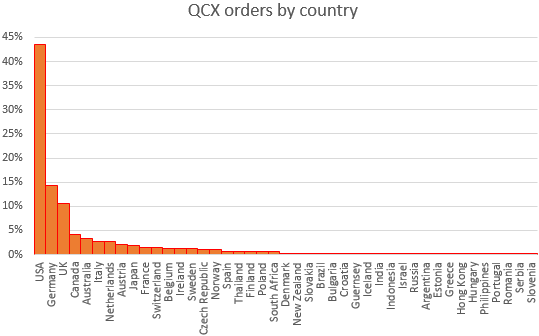 The top 3 countries ordering QCX kits are US (43.5%), Germany (14.2%) and UK (10.5%). The serial number of the latest kit sold at time of writing is 1194. Which is, to put it mildly, a lot of kits, in just over a month! The downside of this immense interest in the new kit is that it has left us scrambling to fulfil the orders as quickly as possible. Originally at launch on 21-Aug-2017 500 kits had been manufactured, of which 90 were already supplied to the RSGB-hosted YOTA 2017 summer camp buildathon. 100 firmware chips were programmed and waiting in the QRP Labs shipment office. It took only a few hours for those 100 to be sold... So ever after, it has been a rush to get more firmware chips programmed and added to the kit bags; and more kits prepared. The shipments should now be speeding up. Lots of firmware chips are now ready for shipment with the kits; and the manufacture of the batches 2 and 3 is completed (500 kits each, total 1000 more kits). If you are in line - please be patient. Even orders for non-QCX kits are delayed by all the busy activity. Please be patient! This year, QRP Labs has a booth at the UK National Hamfest in Newark, UK, see http://www.nationalhamfest.org.uk/ . A selection of assembled QRP Labs kits will be on display, some working demonstrations. I will have 50 of the new QCX CW transceiver kit with me for sale, as well as various other kits from the QRP Labs range. Above all, as always, the most important and enjoyable part of the hamfest will be meeting fellow QRP Labbers. So if you are at the hamfest, then please stop by and say hello. 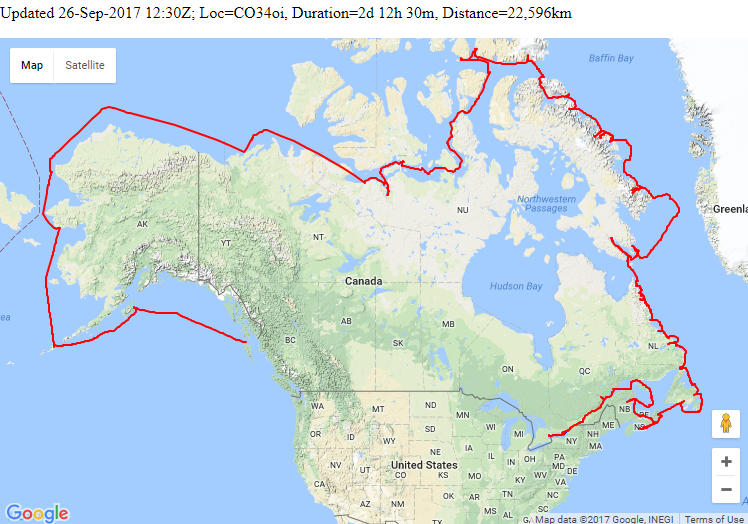 As announced in the June newsletter, QRP Labs is proud to sponsor the Canadian C3 Coast-to-Coast-to-Coast expedition celebrating Canada's 150th birthday, by providing an Ultimate3S kit and accessories (QLG1 GPS receiver kit, relay switched filter board, 20/30/40m Low Pass Filter kits, and enclosure kit. The radio was installed by a team led by Barrie VE3BSB. The Ultmate3S transmits in Extended WSPR mode (with 6-character Maidenhead locator) 24 hours a day autonomously, on 40, 30 and 20m. QRP Labs provided a tracking solution that populates a live map at http://qrp-labs.com/c3 - Jeff VE3EFF has provided a computer and stable internet connection to run the tracking. The map below shows the tracked path to date. 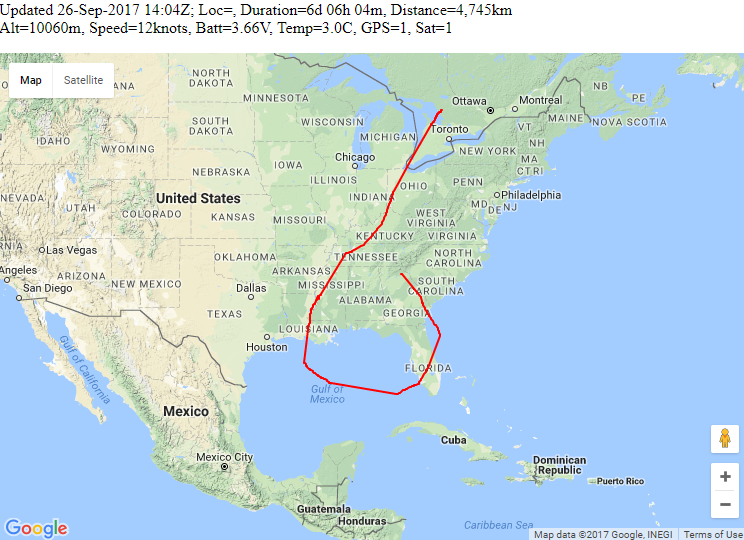 It is being reported on WSPR thousands of times every day. It continues to operate reliably day after day, without any intervention. As you can see, C3 has traveled a long way since the last update! There were some others too, but three balloon flights will be mentioned particularly this month. First, on 05-Sep-17 Dave VE3KCL launched U3B-8, the eight test flight in the QRP Labs U3B balloon tracker development. For full details see http://qrp-labs.com/flights/u3b8. 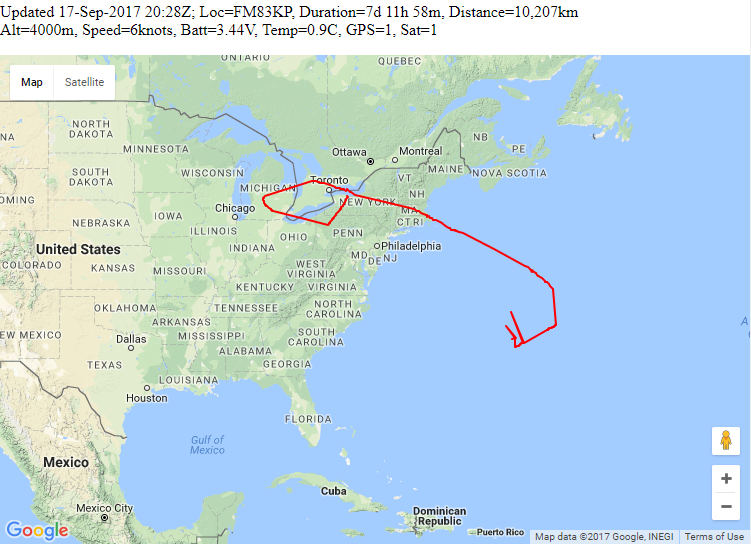 U3B-8 crossed the Atlantic extremely quickly in a little over 24 hours - then meandered around Europe for a while. The flight lasted 9 days and was last heard from in Kyrgyzstan.